I've put together my three reviews of worthy A-level courses which you might be considering for next September. They are all very useful courses, but with significant differences. The traditional Hodder and OUP book-based courses differ in that the former comes in one chunky two year book, whilst OUP's comes in two parts, the first for AS or the first year of an A-level course. The Attitudes16 course by Steve Glover and Nathalie Kaddouri is based on an online platform from which you would download worksheets and share a logon with studenst who would do the interactive parts (Textivate and video work). The two text books are supported by interactive material (Kerboodle) or an e-text book. An excellent resource which should be competing for your attention at the moment is the Attitudes16 course which writers Steve Glover and Nathalie Kaddouri have been working on for some time. You can find it here at dolanguages.com, along with his excellent resources for film and literature. Attitudes16 comes in both AQA and Pearson-friendly formats and could form your sole main resource, or be used to complement other resources. Let's take a close look. So far Steve and Nathalie have completed the six units you'd need for the first year of a two year course or AS-level. The remaining six will follow later. I'm going to focus on one unit; La famille en voie de changement (AQA), which many schools will start with in September. You would find the Pearson material to be very similar. This unit, along with all the others, is broken down into a number of sections: key vocabulary and grammar, facts and figures, a general introduction to the sub-theme including a recorded feuilleton (an original touch), listening and reading tasks, a section called séquences, an oral exam section, translation both ways and a final song. This consists of a number of worksheets: a vocabulary list linked to Textivate interactive tasks (Textivate, if you don't know it yet, allows students to do a wide range of text manipulation tasks) and five grammar worksheets, for example, a sheet with a combined matching and verb conjugation task based on the present tense and a verb agreement tasks based on reflexive verbs. This has a clear and ungimmicky five slide PowerPoint which include outside links, useful phrases and some figures which would feed into to the AO4 category of cultural knowledge - remember that in the new specs students will need to show off what they know about the culture to obtain the highest marks). You could easily use it for oral exploitation and embed phrases like un tiers, un quart, la moitié and so on. You then have a series of briquettes d'information - listening tasks with worksheets, which double as useful language tasks and a further source of background information. You get a transcription, gap-fill and a task which combines verb conjugation with answering questions in French. I like the way Steve combines exercises on form with meaning. Two birds with one stone. So, having done the "pre-theme" tasks, you get on the topic itself in more detail. The recorded feuilleton is accompanied by a range of worksheet tasks: multi-choice, ticking correct sentences, questions in french and gap-fill from a choice of words. These are all mainstream A-level tasks, the like of which you'll find on exam papers. the level is appropriate and content interesting. You also get a transcription combined with a grammar analysis tasks and glossed vocabulary, as well as a set of 18 pictures and paragraphs, the purpose of which is "to give students a socio-cultural perspective of the topic to bring them up to speed with how we arrived at the current situation in France/French speaking countries". In addition there is a research section "designed to give ideas for the personal study part of the oral examination in the full A level". This is really video listening, since Steve has linked to external YouTube videos and combined them with Textivate tasks. I like this approach - most courses rely on pure audio and any video material (where it exists) can be very artificial. The two videos here are about how to charm a young woman and how to find a partner. Should be motivational! Students can do these tasks at home if YouTube is not accessible at school. Steve is going to try to source more video clips from the ina.fr site, the French national archive of video clips. You get a number of tasks, including short paragraphs with exercises ("narrow reading", if you like) and extracts from Zola with glossed vocabulary in the margin and comprehension exercises. This includes linked videos with various oral and written tasks, for example questions in French, lexical analysis and translation. This is excellent supplementary material which might well be used in the second year of a two year course, when you need to revisit the lower sixth themes at a higher level. Here you have photo card examples and what steve calls "Le grand défi idea generator". The boxes of language contain lots of ideas around key aspects of the topic although taken much further than in the initial listothèque activity referred to above. The French to English translation in this unit would fit the second year of the course best and is harder than the exam board specimens you see at AS-level. the English to French is done interactively with Textivate and is at an easier level in this particular unit. You get links to YouTube songs on the theme of family, together with words. So there we have it. Lots of very good material, all skills covered, well pitched, interesting and perfectly appropriate to the exam board specification. What makes this resource distinctive, of course, is that it is not a printed book. How does it work then? Here is the pricing: AQA specification- 6 units - £30 per unit, £40 for a VLE version £150 for all six units inc CD (£5 extra for CD 1+ units). Teachers can share their password with students or take advantage of their VLE, such as Moodle or Firefly. Steve sends out CDs for teachers to be able to put recordings on the VLE. You would need to weigh this up against the cost of individual textbooks for students (costing roughly £22 each, before discount in OUP's case). Photocopying has to be factored in, but you'd be doing some of this with a printed book. I assume that the VLE version would be needed for all student access. Compared with the printed books I have reviewed from OUP and Hodder, Attitudes16 has certain advantages, among them the interactivity (for which you'd pay extra, using, for example the OUP Kerboodle package which is of mixed quality). In addition, the video listening material is more motivational, if less finely tuned to the student's level of comprehension. If you favour authenticity over fine-tuning, then this will suit you. It's worth noting that there will be transcripts available for all the videos - they can be viewed on Textivate. I also find the grammatical content more detailed than in the course books, which need quite a bit of supplementing. This would too, but to a lesser extent. Overall, then, an excellent package which you might want to inspect along with other courses before you make a final decision. This is an 'all-in-one', comprehensive AS and A-level book which, before discount, costs £29.99, making it relatively good value these days for a two year course. It has an unusually long list of authors: Casimir d’Angelo Jean-Claude Gilles Rod Hares Lauren Léchelle, with: Séverine Chevrier-Clarke Lisa Littlewood and Kirsty Thathapudi. You may know of Rod Hares - he wrote Tout Droit with David Mort and Compo. The course rigorously covers all the sub-themes in the specification, includes work on all the prescribed texts and films and builds in a review of sub-themes covered in Year 1 into the year 2 programme. This is useful when you bear in mind the structure of the new A-level and the standalone AS-level. In its early pages the book features maps of France and the francophone world and an explanation for students about how the A-level specification is structured. This introduction clearly lays out the exams to be taken and how the text book itself works. The clarity is notable. The back of the book has a detailed grammar section and verb tables. It is not necessary to work through the book in order, since each 'spread' of work is pitched at a different level, but I imagine many teachers will use the book as a guide to their scheme of work. More on that below. Each unit is prefaced with aims; theme, grammar and strategies, the latter following the current fashion (I wonder if this will be a passing fad). After this each unit begins with a activity called On s'échauffe, a kind of pre-reading/pre-listening task, to get students into the theme and its associated vocabulary. Let's take Unit 2 as an example. 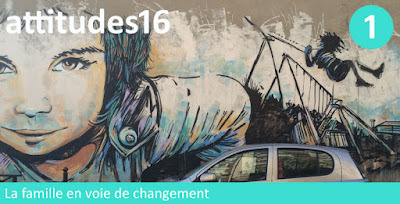 This is the sub-theme of La cyber-société. The warm-up tasks is a brief matching and oral activity to get students talking simply about favourite devices. No-nonsense and effective. There then follows a reading matching task based on short paragraphs, a true/false/not mentioned task, then a sentence level gap-fill grammar task on articles followed by translation into English of the sentences. Réfléchissez sur une liste exhaustive des différents usages de la technologie dans la vie de tous les jours. À tour de rôle, expliquez oralement à la classe les activités les plus importantes pour vous. b Échangez des points de vue sur les questions suivantes. Comment voyez-vous l’avenir des réseaux sociaux ? 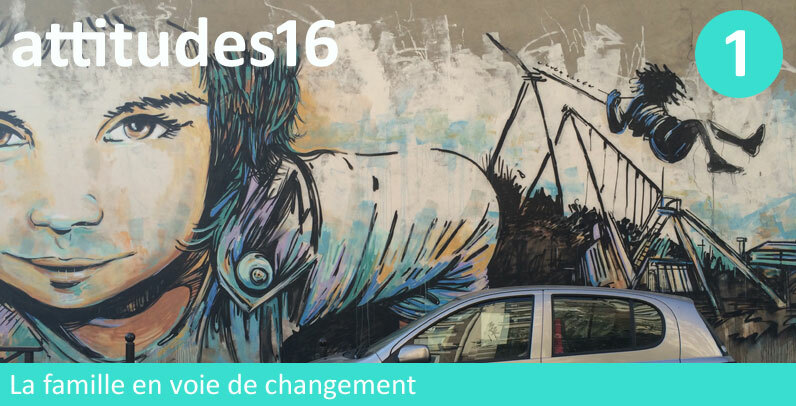 l Comment imaginez-vous les transports dans 25 ans ? Comment voyez-vous les progrès de l’électronique et de la robotique dans la maison ? Comment imaginez-vous la conquête de l’espace dans 50 ans ? I like these. The level is beyond GCSE, allows for easy communication and invites a degree of reflective/imaginative response. The writing task is a write-up of the previous discussion. All very sensible. Following a couple of listening tasks, there is then a strategies section on vocabulary learning, including sensible advice about learning words in context, mnemonics and visuals to aid memorisation. After a short translation passage into French, there is a 'webquest'-style task involving some independent or group research, note-taking and feeding back. The next section in this sub-theme is about cyber-crime and features, amongst other things, a longer text, a drill on adjective agreement, a re-ordering tasks based on a listening text, questions in French on the same text, translation into English and discussion activities. Vous êtes arrivés dans un village reculé d’Afrique. Vous avez montré aux villageois tout ce qu’ils pouvaient faire avec leurs nouveaux téléphones portables. Décrivez dans un court rapport ce que certains d’entre eux ont réussi à faire pour la première fois, et comment cela leur a facilité les choses. The unit ends with a vocabulary list for reference and learning. Following the 12 sub-theme units there is a section which revisits the first six sub-themes (the AS-level ones, if you like) with further activities and the higher level of difficulty (A-level, not AS-level). teachers would find this very useful towards the end of the two year course. The middle of this 291 page book features 34 pages devoted to film and literature, covering, as I mentioned earlier, all the prescribed works. As an example, the section on Les 400 Coups by Truffaut features a plot summary text, a TL comprehension task with 'choose the correct sentences', a listening tasks besed on a conversation about the film, oral and writing tasks. I like the opportunity for students to be able to dip into a film or text in this way - it may even be useful for teachers with little or no experience of teaching film and literature. These 'mini-units' can be used to reinforce language work irrespective of whether you are teaching the works. The text book does not, of course, supply extensive resources for teaching film and literature. Articles, reflexive verbs, position and agreement of adjectives, perfect tense. Comparatives and superlatives, imperfect and pluperfect, direct and indirect pronouns. Irregular perfect tense forms, passives, infinitives, negatives. Imperatives, past historic, imperfect, present and past participles. I would just add the caveat that the requirement to include a greater degree of knowledge of the culture does force the authors into writing pieces focusing on, for example, information and history. This inevitably limits what you can do in terms of imaginative exploitation of the texts. This was always going to be an issue following the remit handed don by ALCAB and the DfE. On the other hand, the literary texts do offer scope for more personal texts. However, examples of interesting texts include an innovative approach to stopping smoking in Belgium (in sub-theme 3 - bénévolat); an article about whether being a UNESCO heritage site is useful (in sub-theme 4 - patrimoine); a feuture about eh development of French cinema (in sub-theme 6 - cinéma); a piece about eh history of trade unions in France (in sub theme 11 - manifestations et grèves). I haven't had access to listening files so cannot assess their suitability, but the exercise types look fine and there appears to be a decent quantity and range of material. Writing about texts and films in exam conditions (which students used to do in previous incarnations of the A-level) will be a challenge, so the book tackles this with two brief chapters on essay planning and writing, one for AS-level, one for A-level. Resources include strategies and a list of useful expressions to use. This is a worthwhile inclusion, though some will find it brief. Sometimes there is just only so much you can squeeze into a book. This is the best A-level text book I have seen for many years. It manages to provide what students need for the new A-levels whilst being inherently interesting and extremely usable. There are bound to be exercises which teachers do not like, but you could work through the book (probably in order) and not need a huge amount of back-up material. It is a bit thin on structured grammar practice, but this is hard to accommodate with a text book so this is not a complaint at all. The book is very clearly laid out, colourful without being gimmicky and the resource material and exercises types are well chosen. There are choices to be made in terms of how you exploit the book. As I mentioned above, each unit is graded for difficulty, so do you just go through the whole unit or do you dip in and out, doing the easier material of a unit first, then coming back to the harder material later. This latter approach feels a bit clumsy to me, but it may depend on the ability and prior attainment of the students you are teaching. You would also need to consider the order that the grammar is presented within and across units. The sequence above makes pretty good sense which might lead you to simply working through each unit and building your scheme of work around the structure of the text book. Students with very weak skills post-GCSE will find the material a challenge so some teachers might want to do a rigorous grammar revision course at the start of Y12, or just strongly reinforce the grammar elements in each unit. I am hoping to review the text book from OUP very soon; I hope it is just as good, but I do urge you to get hold of a copy of this Hodder book. It's excellent and so much better than the previous generation of A-level books. This course is written by Rob Pike, Colin Povey and Paul Shannon. Rather than produce an all-in-one book for the full A-level, Oxford have decided to publish two books, this first one being for either AS-level or the first year of a full A-level course. Either approach seems sound, but you might want to consider the financial implications of buying one big book compared with two slimmer volumes. The 2-year Hodder book is nearly £30 before discount, the two OUP books come to £44 before discount. That is a significant difference if you have quite a few students. This may be a good point to make when haggling with the rep! AQA French (what happened to those snazzy old titles like Au Point, Tout Droit, Vécu and Objectif Bac?) looks like another very worthy contender for your capitation budget. The content is similar to the Hodder book and ticks all your new specification boxes: lots of texts awash with cultural information, translation both ways, appropriate listening and reading comprehension tasks, research tasks, summary tasks, oral activities and a grammatical progression (of sorts) and dedicated chapters about literature and film. Each unit (which the authors say can be done in any order) comes with a vocab list at the end, as well as lists of key expressions. I imagine most teachers will start from the beginning with the family sub-theme. There really is a lot of reading material in this book, although it would be nice to see a bit more detailed exploitation of some of the texts. The format seems to be: text, comprehension exercise, "translate the first two paragraphs", then move on to listening, summary and translation into French. I'd like to see more thorough grammatical practice and lexical work, but space probably does not allow for it. Teachers will need to add this extra level of exploitation. I do like the inclusion of a résumé section at the end of each unit. The texts are interesting and informative, but can present a bit of a challenge when it comes to using them for communicative work. (This is inherent in the subject content provided by the DfE - the new emphasis on cultural knowledge imposes certain limits on the amount of personalised discussion you might want students to engage in.) If I were still teaching I would build this into lessons anyway, whilst ensuring students have enough knowledge to use when it comes to exam time. I have not heard the listening tracks so cannot vouch for their quality - there seems to be plenty of material, though, with familiar exercise types. The experience of the writers comes across in the well-chosen oral tasks and well-pitched translation sentences. I would say that the oral tasks are a bit on the general and demanding side. Just a word about that grammatical progression. If you take the chapters in order, you get: imperfect, perfect, past historic, infinitive constructions, object pronouns, present tense, conditional, future, adjectives, the subjunctive, then re-visits of some of these. Some teachers might feel this is more haphazard than the approach taken with the Hodder book. Others teachers may not be overly concerned with that kind of traditional progression from easier to more complex. The inclusion of a separate short chapter on essay writing is welcome, although I am not sure whether students need to be too worried about the traditional structure of intro/key points/conclusion since the new mark schemes give no marks for structure or cohesion. The example material in the sections on film and literature come from what will no doubt be two popular choices from the prescribed lists: La Haine and L'Etranger. Overall, then, you have another more than acceptable resource here for you and your students. The authors have done a super job. The bar has been raised a good deal with these latest books. 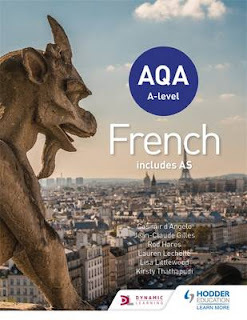 The AQA A-level French from Hodder may have the edge (because of its grammatical progression, better value and slightly greater "wow" factor), but some teachers may prefer to get two separate books, especially if they have a significant number of students doing only a one-year course. I would get copies of both courses and weigh up their relative merits very carefully with your department. In the recent past I would not have bought a textbook at all for A-level, but these new ones will perform a very good role indeed. They are both very usable, which is slightly bad news for frenchteacher.net. More work for me then!